Due to the joy of being on high doses of prednisone for a time (story for another day), I’m cutting as much sodium out of my diet as possible, so I don’t end up resembling my 5th grade self – the first time I experienced my love-hate relationship with this drug. So, anyway, I’ve been experimenting with home made alternatives to pre-packaged, over salted foods. 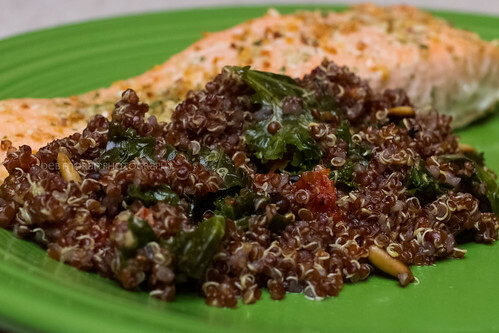 For dinner tonight, we’re having salmon, and I decided to make something with quinoa on the side. Rinse and prepare the quinoa according to package directions. Here, I’m using the chicken stock instead of water for cooking the quinoa. While the quinoa is simmering, toast the pine nuts on medium to low heat in a sauté pan. Set toasted pine nuts aside, and sauté the kale, sun dried tomatoes, and garlic with olive oil in the same pan. 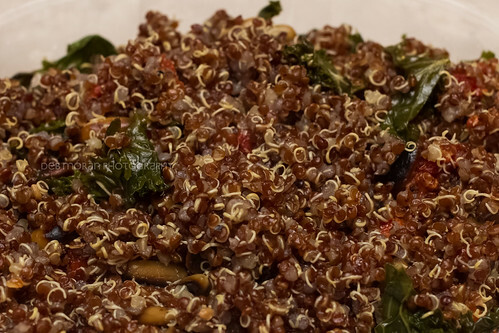 When quinoa is ready, combine with the kale, sun dried tomatoes, garlic, and pine nuts, and serve.